Popeye Statue, Sailors in Limestone, The Crystal City Statue That Might’ve Been. Architect Max Sandfield's proposed statue of Popeye. 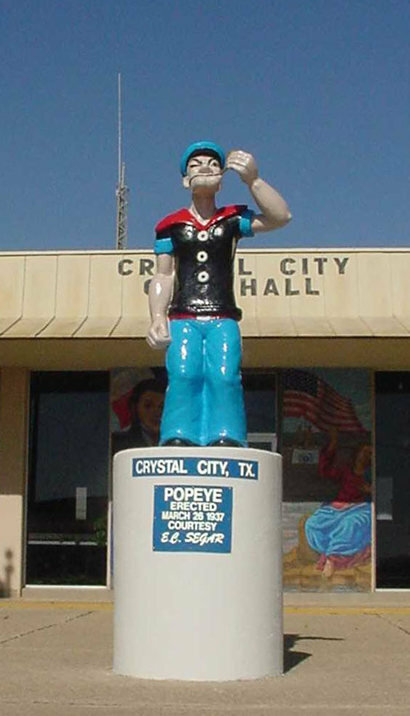 Of the many whimsical statues around the state of Texas - Popeye, of Crystal City is one of the most photographed. Or it would be if Crystal City was a little closer to a major highway. Not only has Popeye been the unpaid spokesman for spinach for 75 years, his statue has also become the unofficial ambassador for Crystal City, Texas. Looking as shiny as a spray-painted pinata, this fiberglass effigy shares a secret with museum statuary in Rome, Paris and London. The secret is: (they are reproductions). To protect Popeye from vandals, the “real” statue stands safely within the walls of the Crystal City Hall. This duplicate is placed as an offering to whatever rival high school teams might want to defame or insult the Crystal City team by defacing the now-famous landmark. Once the most recognizable sailor in the world, Popeye’s popularity has dipped in recent years. Despite a severe (and unique) speech impediment; he managed to get the message across to millions of children world-wide, that (given a chance) iron-rich spinach could cure everything from pellagra to bullies. And, if you ate enough of the stuff, you wouldn't even need a can-opener. The statue is not actually a monument to Popeye, but to his creator, E. C. Segar, of Chester Illinois. Segar, who made the astounding sum of $400,000 a year in the 1930s, died [mysteriously] at the age of 38. Mr. Segar’s signature on the statue’s base today might be appearing on a very different statue if the vote of a design committee had gone differently. The contest was held back in 1937 to award the contract. A man named Max Sandfield saw the announcement and entered the fray. Sandfield, a native of Lithuania, had been raised in San Antonio and was residing there when he read of the competetion. He was already a practicing architect, having earned his degree from MIT in 1925. He practiced in both San Antonio and New York before moving to Dallas in 1945. Sandfield’s entry shows a statue far different from the one standing today in Crystal City. 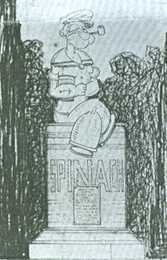 In his sketch, Mr. Sanfield has Popeye sitting on a can of spinach about the size of a 55-gallon drum with a more-to-scale second can held against his chest, ready to be opened in case of an emergency - or upon the arrival of Bluto. The pipe is there of course, along with the familiar squint and tattoo, but the one thing that’s different - really different - is the proposed material. Max Sandfield suggested that Popeye be carved from native Texas limestone. Today the suggestion would’ve won him the contest hands-down, but back in 1937 limestone might have been considered too dignified for a mere cartoon character - despite whatever contributions to nutrition-awareness. Medina, Texas has since erected an oversized limestone apple - and courthouses around the state are carved with a variety of flora, fauna, and limestone cowboys. It appears Mr. Sandfield’s proposal was ahead of its time. A statue of “Popeye” will be erected in the Winter Garden Section in Crystal City, Texas in honor of E.C. Segar, creator of the “Popeye” comic strip if an idea proposed by O. P. Schnabel, San Antonio manager of the Jefferson Standard Life Insurance Company, is carried out. A drawing of the proposed statue has been made by Max M. Sandfield, San Antonio Architect. The statue, to be carved of Texas limestone, will be in the form of a large can of spinach as a base with Popeye sitting on the can eating out of another can. The erection of this statue in the heart of the world’s greatest spinach-growing country will be a fitting tribute to the man who has made both young and old alike “Spinach-conscious”! If Mr. Sandfield was disappointed that his proposed design was not used, it didn't discourage him. In collaboration with Howard Meyer, Max Sandfield’s design of Dallas’ Temple Emmanu-el was hailed at its 1957 dedication as “one of the handsomest synagogues in the United States.” The quote comes from the Encyclopedia Britannica.. The temple was also awarded a 1957 Merit Award from the American Institute of Architects and Mr. Sandfield received a 25-Year Award from the Dallas branch of the AIA, an organization he once served as president. Sandfield was also a noted home designer and sculptor and several pieces of his work accent the courtyards at the temple. The Columbian Country Club in Carrolton, Texas was another noted Sandfield design. 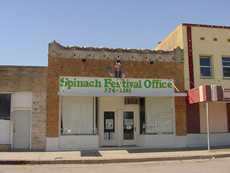 Spinach Festival Office in Crystal City. Not much is known of the design competetion or the judging. Any information would be appreciated, including any details of (alleged) Spinach-eating contests held in the 30s. The Crystal City chamber of commerce was unavailable for comment - but a recording assured us our call would be returned. One bronze statue of Popeye stands in E. C. Segar's hometown of Chester, Illinois. Vandals have pulled it down on at least one occassion (no damage). Two others stand in Arkansas about 70 miles apart. In Alma, Arkansas, off I-40, the paper-mache statue was stolen so often that it had to be covered in fiberglass and chained in place. The other Arkansas statue is near Springdale about 60 miles North. Considering this recent hostility toward cartoon statues, Crystal City is wise to keep a spare. Our thanks to Mr. Norman Sandfield of Chicago for making us aware of his father's design and for providing the content used in this article.